From 4576 references seven studies met the inclusion criteria (including 114 009 participants). None of the studies was a randomized trial, six were cohort studies, and one a cross sectional study. Large variation was observed between these seven studies for measurement of chocolate consumption, methods, and outcomes evaluated. Five of the seven studies reported a beneficial association between higher levels of chocolate consumption and the risk of cardiometabolic disorders. The highest levels of chocolate consumption were associated with a 37% reduction in cardiovascular disease (relative risk 0.63 (95% confidence interval 0.44 to 0.90)) and a 29% reduction in stroke compared with the lowest levels. Global warming will cause significant harm to the health of persons and their communities by compromising food and water supplies; increasing risks of morbidity and mortality from infectious diseases and heat stress; changing social determinants of health resulting from extreme weather events, rising sea levels, and expanding flood plains; and worsening air quality, resulting in additional morbidity and mortality from respiratory and cardiovascular diseases. Vulnerable populations such as children, older persons, persons living at or below the poverty level, and minorities will be affected earliest and greatest, but everyone likely will be affected at some point. Family physicians can help reduce greenhouse gas emissions, stabilize the climate, and reduce the risks of climate change while also directly improving the health of their patients. Health interventions that have a beneficial effect on climate change include encouraging patients to reduce the amount of red meat in their diets and to replace some vehicular transportation with walking or bicycling. Patients are more likely to make such lifestyle changes if their physician asks them to and leads by example. Medical offices and hospitals can become more energy efficient by recycling, purchasing wind-generated electricity, and turning off appliances, computers, and lights when not in use. Moreover, physicians can play an important role in improving air quality and reducing greenhouse gas emissions by advocating for enforcement of existing air quality regulations and working with local and national policy makers to further improve air quality standards, thereby improving the health of their patients and slowing global climate change. Robert A. Bell, et al. Suffering in Silence: Reasons for Not Disclosing Depression in Primary Care. Ann Fam Med. 2011;9(5):439 -446. To determine the association between TV viewing and risk of type2 diabetes, fatal or nonfatal cardiovascular disease, and all-cause mortality, a meta-analysis of all prospective cohort studies were performed. And the dose-response relationship between TV viewing with the risk of these health outcomes was quantified. Of the 8 studies included, 4 reported results on type 2 diabetes (175 938 individuals; 6428 incident cases during 1.1 million person-years of follow-up), 4 reported on fatal or nonfatal cardiovascular disease (34 253 individuals; 1052 incident cases), and 3 reported on all-cause mortality (26 509 individuals; 1879 deaths during 202 353 person-years of follow-up) (Figure1). The mean (SD) follow-up duration was 8.5(1.9) years for type2 diabetes, 10.4(7.4) years for fatal or nonfatal cardiovascular disease, and 6.8(2.6) years for all-cause mortality. Outcome assessment was Self-report for Type2 diabetes, Registry for Cardiovascular disease and All-cause mortality (Table). The pooled relative risks per 2 hours of TV viewing per day were 1.20 (95% CI, 1.14-1.27) for type 2 diabetes, 1.15 (95% CI, 1.06-1.23) for fatal or nonfatal cardiovascular disease, and 1.13 (95% CI, 1.07-1.18) for all-cause mortality (Figure2). While the associations between time spent viewing TV and risk of type 2 diabetes and cardiovascular disease were linear, the risk of all-cause mortality appeared to increase with TV viewing duration of greater than 3 hours per day (Figure3). The estimated absolute risk differences per every 2 hours of TV viewing per day were 176 cases of type 2 diabetes per 100 000 individuals per year, 38 cases of fatal cardiovascular disease per 100 000 individuals per year, and 104 deaths for all-cause mortality per 100 000 individuals per year (based on incidence rate in the United States). Longer duration of TV viewing time is consistently associated with higher risk of type 2 diabetes, fatal or non fatal cardiovascular disease, and all-cause mortality. Further study is needed to determine whether reducing prolonged TV viewing can prevent chronic disease morbidity and mortality. The followings are the limitation of this study; A possibility of publication bias, the relatively small number of studies, the possibility of residual or unmeasured confounding, the possibility of the participants with subclinical stages of chronic disease, Single point measurement (the assessment of TV viewing relied on self-report at baseline), inappropriate control for physical activity, and miss of studies (eg, non-English-language studies). Beck A, et al. Severity of depression and magnitude of productivity loss. Ann Fam Med. 2011;9(4):305-311. 1) little interest or pleasure in doing things? 2) Feeling down, depressed, or hopeless? 3) trouble falling or staying asleep, or sleeping too much? 4) Feeling tired or having little energy? 5) poor appetite or overeating? 6) feeling bad about yourself – or that you are a failure or have let yourself or your family down? 7) trouble concentrating on things, such as reading the newspaper or watching television? 8) moving or speaking so slowly that other people could have noticed? Or the opposite – being so fidgety or restless that you have been moving around a lot more than usual? 9) thoughts that you would be better off dead, or of hurting yourself in some way? David T. Liss, Jessica Chubak, Melissa L. Anderson, Kathleen W. Saunders, Leah Tuzzio, and Robert J. Reid Patient-Reported Care Coordination: Associations With Primary Care Continuity and Specialty Care Use Ann Fam Med 2011 9: 323-329. Care coordination is increasingly recognized as a necessary element of high-quality, patient-centered care. This study investigated following. 1. 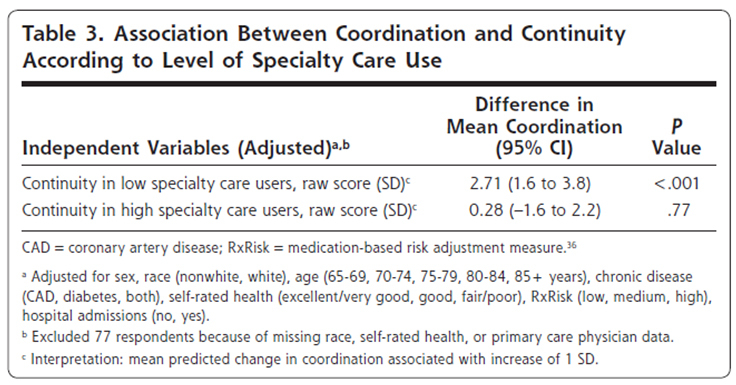 The association between care coordination and continuity of primary care. Data collection : During March through September 2008, data were collected from questionnaires mailed to Group Health members who were eligible to enroll. Participants: Eligible patients were aged 65 years or older, received care at a Group Health clinic in King County or Pierce County in western Washington State, and had at least 1 of the following chronic conditions: diabetes, coronary artery disease (CAD), or congestive heart failure (CHF). Continuity measure: Primary care visit concentration. Analysis: Linear regression was used to estimate the association between coordination and continuity, controlling for potential confounders and clustering within clinicians. To determine whether the association between care coordination and continuity was modified by level of specialty use, an indicator for high specialty care use (10 or more specialist visits during the 1-year study period) and an interaction between high specialty care use and care continuity were included in the model. Among low specialty care users, an increase of 1 standard deviation in continuity of care was associated with an increase of 2.71 in coordination (P <.001, Table 3). Among respondents with high specialty care use, however, the model showed no association between continuity and reported coordination(P = .77). High use of specialty care may strain the ability of primary care clinicians to coordinate care effectively. Future studies should investigate care coordination interventions that allow for appropriate specialty care referrals without diminishing the ability of primary care physicians to manage overall patient care. Memantine is a low- to moderate-affinity, uncompetitive N-methyl-Daspartate receptor antagonist. Controlled trials have demonstrated the safety and efficacy of memantine monotherapy for patients with moderate to severe Alzheimer disease(AD) but no controlled trials of memantine in patients receiving a cholinesterase inhibitor have been performed. Objective To compare the efficacy and safety of memantine vs placebo in patients with moderate to severe AD already receiving stable treatment with donepezil. A randomized, double-blind, placebo controlled clinical trial of 404 patients with moderate to severe AD and Mini-Mental State Examination scores of 5 to 14, who received stable doses of donepezil, conducted at 37 US sites between June 11, 2001, and June 3, 2002. A total of 322 patients (80%) completed the trial. Participants were randomized to receive memantine (starting dose 5 mg/d, increased to 20 mg/d, n=203) or placebo (n=201) for 24 weeks. Change from baseline on the Severe Impairment Battery (SIB), a measure of cognition, and on a modified 19-item AD Cooperative Study? Activities of Daily Living Inventory (ADCS-ADL19). Secondary outcomes included a Clinician’s Interview-Based Impression of Change Plus Caregiver Input (CIBIC-Plus), the Neuropsychiatric Inventory, and the Behavioral Rating Scale for Geriatric Patients (BGP Care Dependency Subscale). The change in total mean (SE) scores favored memantine vs placebo treatment for SIB (possible score range, 0-100), 0.9 (0.67) vs ?2.5 (0.69), respectively (P_.001); ADCS-ADL19 (possible score range, 0-54), ?2.0 (0.50) vs ?3.4 (0.51), respectively (P=.03); and the CIBIC-Plus (possible score range, 1-7), 4.41 (0.074) vs 4.66 (0.075), respectively (P=.03). All other secondary measures showed significant benefits of memantine treatment. Treatment discontinuations because of adverse events for memantine vs placebo were 15 (7.4%) vs 25 (12.4%), respectively. In patients with moderate to severe AD receiving stable doses of donepezil, memantine resulted in significantly better outcomes than placebo on measures of cognition, activities of daily living, global outcome, and behavior and was well tolerated. These results, together with previous studies, suggest that memantine represents a new approach for the treatment of patients with moderate to severe AD. Obesity is an established and modifiable risk factor for urinary incontinence, but conclusive evidence for a beneficial effect of weight loss on urinary incontinence is lacking. Researchers randomly assigned 338 overweight and obese women with at least 10 urinary incontinence episodes per week to an intensive 6-month weight-loss program that included diet, exercise, and behavior modification (226 patients) or to a structured education program (112 patients). The mean (±SD) age of the participants was 53±11 years. The body-mass index (BMI) (the weight in kilograms divided by the square of the height in meters) and the weekly number of incontinence episodes as recorded in a 7-day diary of voiding were similar in the intervention group and the control group at baseline (BMI, 36±6and 36±5, respectively; incontinence episodes, 24±18 and 24±16, respectively). The women in the intervention group had a mean weight loss of 8.0% (7.8 kg), as compared with 1.6% (1.5 kg) in the control group (P<0.001). After 6 months, the mean weekly number of incontinence episodes decreased by 47% in the intervention group, as compared with 28% in the control group (P = 0.01). As compared with the control group, the intervention group had a greater decrease in the frequency of stress incontinence episodes (P = 0.02), but not of urge-incontinence episodes (P = 0.14).A higher proportion of the intervention group than of the control group had a clinically relevant reduction of 70% or more in the frequency of all incontinence episodes (P<0.001), stress-incontinence episodes (P = 0.009), and urge-incontinence episodes(P = 0.04).